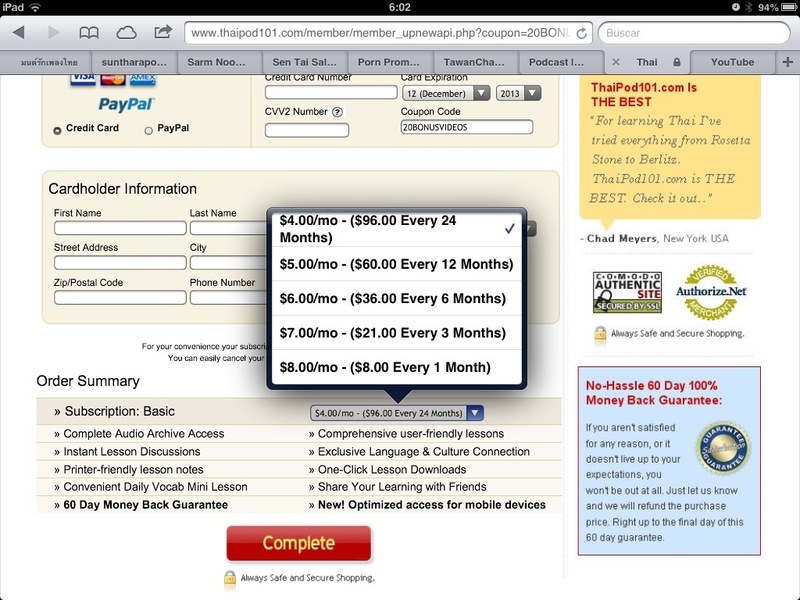 Learn Thai Podcast requires a hefty initial investment of $197, which is why I put off signing up for so long. Yes, it’s a five-year subscription, so it ends up being about $3.30/month, but it takes a bit of a leap of faith to invest that up front when all you can check out for free is the beginning materials. Luckily for me, I managed to get my subscription for just $97 because of a sale they had for the King’s birthday. Now that I have it, though, I can see it is well worth the $197 they ask — it’s actually probably worth much more. As an aside, there’s no reason to fear that the price will increase anytime soon — the $197 “special offer” has existed about as long as the site. You have to scroll through pages of this before you get to the tiny “no thanks” link at the bottom so you can actually enter the site. Once inside, you can see the different prices for memberships. The cheapest one is about 70 cents more per month than Learn Thai Podcast, assuming there are enough materials on ThaiPod101 to keep you busy for five years (it doesn’t look like it to me). Upon clicking the “upgrade” button on ThaiPod101, I found the prices are misleading. A premium membership is only $10 a month if you pay $240 at once and a Basic membership is only $4 a month if you pay $96 at once. If you want to pay month by month, memberships are $25 and $8 per month, respectively. Unfortunately, the best features of ThaiPod101 are only available to Premium members, and I don’t think there are enough materials at this pount to justify a two-year membership (more on that below). In this section, I’m only talking about audio clarity. On this front, ThaiPod101 has more consistently clear audio. All of their audio appears to have been recorded in a studio and has no background noise (other than intentional sound effects) at all. Learn Thai Podcast, however, takes their authentic conversation audio and video (the aspect I am most interested in) from various sources, including handheld cameras on a windy day. It’s a bit rough on the untrained ear. After each conversation the Thai voice of the podcast (Jo?) speaks the phrases again with studio-quality sound. Their grammar and vocabulary lessons are perfectly clear. Thai Pod 101 has a 7-day premium trial where you have access to all their materials, so I was able to listen to beginning, intermediate, and advanced recordings. The English introductions and discussions after were so dry and dull I couldn’t handle it. Based on my husband’s wincing during the Thai portions, my guess is the same is true for the Thai sections. My goal for learning Thai isn’t to sound like a monotone textbook, and the lack of phrasing by the American speaking Thai (in all authentic Thai I’ve heard, there are longer spaces before/after certain words to separate phrases and clauses — these recordings seemed to put an equal space between each word) was distressing. The native Thai speaker spoke well, but it seemed like the non-native actually got more speaking time on most dialogues. Also, for dialogues among three or more people, the two speakers tried to disguise their voices. The male (American) speaker, when being a third person, sounded like Frank Oz trying to be somewhere in between Yoda and Fozzie Bear. The result was painful to listen to. On the plus side, the material, particularly at the more advanced levels, talked about important parts of Thai culture. That would have kept my interest despite the monotony if the information weren’t presented in the form of a second grade book report. Learn Thai Podcast, on the other hand, has conversations and monologues that are husband-approved in their authenticity. In fact, Learn Thai Podcast is the only learning resource I have that hasn’t made my husband double over in laughter. When I showed him some of the intermediate and advanced dialogues and grammar lessons, he was pretty impressed. 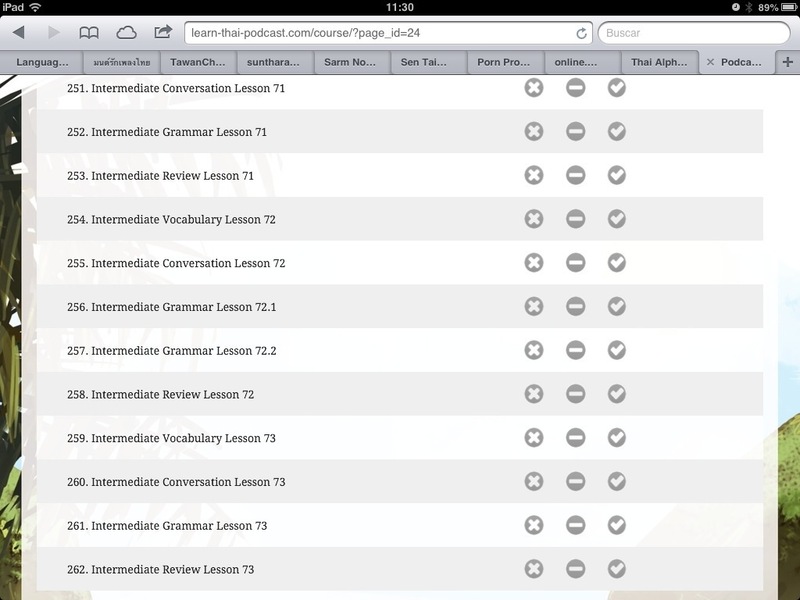 That’s seventy-three intermediate lesson cycles alone! Not to mention the six advanced cycles, five advanced news cycles (note each cycle is four lessons), sixty beginner grammar, review, and bonus lessons, 317 beginner vocabulary lessons (each with about ten words). I had heard Learn Thai Podcast had a lot of lessons, but I didn’t expect it might actually keep me busy for the next five years. ThaiPod101 has a good amount, too, especially in the advanced audio blog section (there are about 50 lessons there), but it simply doesn’t even approach the number of lessons Learn Thai Podcast has. The fact is, I’m not going to study with something that bores me, and ThaiPod101 is painfully boring. My toaster has more emotion than those speakers, and the banter is some of the worst I have ever heard. It has frills — opening music, sound effects — but I don’t need frills, I need speech that sounds like human beings. I couldn’t even pay attention to the explanation of the phrases in the dialogues. Bad, bad, bad. Learn Thai Podcast has no frills at all. It’s low-budget and straight to the point, just the way I like. Plus, the explanations of the dialogues and the number of repetitions are perfect. I look forward to studying with Learn Thai Podcast, even if it’s just the deadly themed vocabulary lists (something ThaiPod101 has managed to make even more boring than usual). Most importantly, I’m learning. I understand so much more of what my in-laws say than before, and I’m getting a better grasp of how to string words together. Both Learn Thai Podcast and ThaiPod101 have transcripts of all their audio materials in both Thai script and romanization, and both have flashcard features for words and phrases. Both provide Thai script to read along with as you listen. For Learn Thai Podcast, the transliteration is far enough below the Thai that it can easily be covered up or ignored if you’re like me and think transliteration is a tool of the devil. They also have pdf files of the transcriptions. ThaiPod101 has dialogue transcriptions on the screen below the audio player as well as pdf files in English, Thai, and transliterated Thai. I would say both programs are equal here. As far as learning how to read Thai script, Learn Thai Podcast has a section for that that I haven’t yet explored since I can already decode. ThaiPod101 has an alphabet page, but I couldn’t find anything on actually learning how to read. I think both are equally easy to navigate and both are equally visually appealing. Because of ThaiPod101’s aggressive and misleading marketing practices and their use of non-native speakers who speak like robots, I found Learn Thai Podcast to be more valuable for me. If ThaiPod101 were to be more upfront about pricing and/or charge $5 a month for Premium, I would consider a two-year membership because the advanced blogs, though dull, are pretty decent listening practice and it’s hard to find extended texts with audio. As it is, though, they’ve made a bad impression on me as a company. Since writing this post, I’ve e-mailed both Learn Thai Podcast and ThaiPod101 with questions about their features. Both companies responded to me within 24-hours with very helpful responses. I had read elsewhere that ThaiPod101 customer service isn’t great, but I have to strongly disagree — they were excellent! It actually makes me feel a little more forgiving about their marketing techniques and the stodgy acting on the beginner-level podcasts. They reset my 7-day trial, so I think I’ll do a review later his week on the specific features of each program so people can make informed choices. Basically, I’m trying to write the reviews I wish had been available when I was trying to choose between the two. This entry was posted in Learning Thai and tagged Language Learning, Learn Thai Online, Learn Thai Podcast Review, Thai Language, ThaiPod101 Review. Bookmark the permalink. There is another course I found and I wonder what you think of it. There is another course I found and I wonder what you think. Thai-language.com is an excellent resource. It’s my go-to place when I have questions about specific words and phrases. Hi. Have you considered High Speed Thai? I’m glad I chanced apon your post as I was about to buy into thaipod101.com. You are right about their “abrasive” marketing techniques. It was rather offputting. I will check out Thai Podcast. Thanks! Hi, I consider learning the Thai alphabet an integral part of learning the language. I hope to do this as almost a first step, particularky how the vowels impact on the way the cononsants are pronounced. Are you able to shed any light on how “Thai Podcast” deals with this? Does it provide adequate instruction? In particular does it do it with video support? Or would you suggest ThaiPod101 may be superior in this respect,? BTW Your page is very helpful. Like most others – I’m seeking the “greatest bang for mu\y buck”. Thanks again. For learning the writing system and all the tone rules, I think Benjawan Becker’s Thai for Beginners is excellent. Since I had already learned with that book and audio, I didn’t learn from the podcasts, and I didn’t really check that aspect out. If I can find the time, I’ll check them out and post a compare/contrast. I’ve already reviewed Learn Thai Podcast and I’m now researching for a review of Thaipod101. I just wanted to thank you for this refreshing review. No course is perfect, and getting the good with the bad is helpful when making a decision. I wrote this post just over a year ago. Since then, I’ve subscribed to and used both programs. Even though I still like Learn Thai Podcast more, ThaiPod101 grew on me. The fact is, both programs have helped me about equally; whatever I learn, whether it’s vocabulary or a grammar rule, I end up hearing (and understanding!) the next time I’m hanging out with my in-laws. Having both programs increases the variety of vocabulary and structures I’m introduced to, and that’s not a bad thing at all. Hi Mezzie. Thanks so much for your most helpful observations. I have found myself hovering over the “Buy” button at ThaiPod101 any number of times, but then I recall the voice and intonation of the English speaking male instructor and I retreat. Not to be unkind, but the young man’s delivery seems suitable for preschool. I had not come across the Learn Thai Podcast and will have to look into it. While I’m here I want to make you aware of another resource. I don’t know if you’ve stumbled across Stuart Jay Raj. He has a Thai learning website – jcademy.com. I’m not suggesting you need yet another series of lessons, rather, I wanted to alert you to this amazing individual. A linguist, originally from Australia, he speaks over 16 languages, with a particular passion for Asian languages. A quick search on Youtube will yield a number of videos featuring his infectious enthusiasm for language learning. Thanks for this. I agree that aggressive marketing is off putting… but thanks for the quantitative review, its helped me to decide. Can more than one person use a single account at Learn Thai Podcast? My husband and I would like to study together but I can’t tell if that’s possible on one account. That’s a good question that I think only they can answer. Go ahead and send them an e-mail; they responded to me pretty quickly. – After the beginner level TP changed the male American speaker with the strong accent to a heritage speaker who at least spoke Thai at home, although with a monotone delivery. But it is still an improvement. The female speakers are native Thai speakers with clear pronunciation. – Up to and including the intermediate level, which is where I currently am, the Thai is colloquial and some of the expressions can cause a wince from native speakers. There are several phrases my Thai partner has told me not to use. In fairness though, the program tells the listener what level of Thai is being used, e.g., formal, polite, impolite, etc., but be careful. – More than occasionally, I have problems with the flashcards, e.g, not loading, no example sentences, or unclear definitions, although the rest of the software usually runs well. – The topics are well laid out, easy to find, and the learning system progressive. There are not a lot of visuals, so you just have to get used to that. As a aside, I use it for Portuguese at a 50% second language discount but you need to hunt for the reduction. It does not come automatically and as you pointed out the marketing can be deceptive. – Although I am also at only the intermediate level, this is the more complete and robust course. It will probably take five years to get through it all. – So far no raised eyebrows from my partner or Thai speaking friends, so I assume that I am speaking correct and accepted Thai. The delivery may be a little more formal and sentences longer than normally spoken by Thais but that is the better option if you are a farang. After all, politeness in language is valued and the longer sentences make us easier to understand, at least in my case, which is an older male. – The production is low budget so everything is straight forth with no frills or games. The explanations are clear and the Thai in the videos is everyday and useful. The lessons build on on one another but the menu and groupings do not allow easy reference to themes. – Whether it is my local internet or not, I do not know, but I often have to give up because of poor response times. Overall, both are solid programs and have good immediate and advanced levels. If you are a serious student of Thai and have the budget, using both is a good idea. If you decide to use just one, Thaipod101 is more colloquial and geared toward a younger audience, while Learn Thai Podcast is more useful if you are settled in Thailand and into learning Thai for the long haul. Mezzie, do you know if Learn Thai Podcast has sale of $97 every year on King’s birthday or promotion on other times? Excellent Review. I signed for the free 7 day trial with ThaiPod101, sadly life happened and I was barely able to check out the lessons from the paid subscriptions. But with the free life time membership and the mobile app, I still plan to look into it. While looking around I had found several reviews of Learn Thai Podcast and found their free Thai Holiday course so I decided to give it a try. So far so good. One thing that I really like is that they give literal translations of the target language, which has always helped me to learn to create my own sentences. I have still a few questions, before I make my choice and so I have emailed them. Thank you for this and I hope your understanding of your in-laws and theirs of you continues to improve.